Practicing yoga everyday can completely transform your mind and body. Yoga helps you find more energy to get through the day, strengthens your muscles, and improves your flexibility. It can also have a dramatic effect on your mind, improving your mood and relieving the symptoms of common mental disorders like anxiety and stress. This guide will share some information about the ways that yoga can help you remain fit and healthy. We’ll also highlight the 5 best everyday yoga poses for maintaining your health and fitness. Why is yoga so good for you? Yoga is widely considered to be one of the best forms of exercise for the body. The most obvious benefit of yoga practice is improved flexibility. Yoga gives your muscles and joints a much greater of motion. This makes it easier to perform well athletically and to perform common tasks. Many yoga poses require a great deal of strength to complete. Even a simple pose like Navasana (Boat Pose) will require immense strength from your abdominal muscles if you attempt to hold it for more than 30 seconds. Regular yoga practice will help your muscles become lean, toned, and very strong. Yoga can change your body in many ways — increasing your metabolism, improving cardiovascular fitness, and making you stronger. It also encourages you to live a healthier life outside of the yoga class by eating well and getting enough sleep. These changes will provide you with an abundance of energy and vitality, which makes daily living much more enjoyable. Yoga has some interesting effects on the digestive system and metabolic rate. Multiple studies have found that the metabolic rate can be stabilised by performing yoga. This makes yoga very useful for weight loss. The effect that yoga has on the body can reduce the risk of chronic illnesses like heart disease, high blood pressure and diabetes. The improvements that yoga brings to a person’s balance, core strength, and flexibility makes them perform better athletically. Yoga also makes injuries on the sporting field less likely because you will have better flexibility and muscle tone. Regular yoga practice helps you remain calm and centred. It can also reduce stress and relieve the symptoms of chronic mental disorders like anxiety and stress. Here are 5 powerful yoga poses that can be performed every day to deliver excellent health benefits. The Half Sun Salutation combines several poses. It is a fantastic way to start the day, stretching your back, chest, and legs. Start in Mountain Pose (Tadasana), which is standing up with your arms by your side. Your shoulders should be over your hips, thigh muscles engaged, and feet firmly on the floor. As you inhale, come into Raised Arms Pose (Urdhva Hasatansana). Simply lift your arms straight out to both sides until they are over your head and pointed towards the sky. Look up at your hands while keeping your shoulders relaxed. 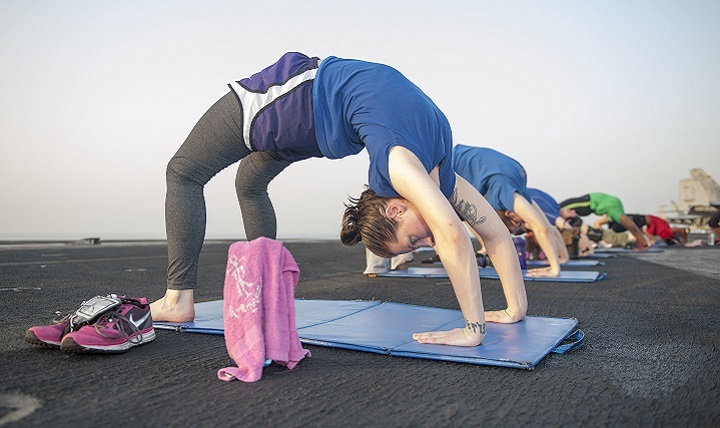 As you exhale, perform a swan dive into a Forward Bend (Uttanasana) — which is legs straight, bending at the waist with your hands on the ground. As you inhale, move into Flat Back (Ardha Uttanasana) by moving your hands forward and aligning your back so it is nearly parallel to the floor. As you exhale, come back into a Forward Bend. Inhale, then stand up straight again as you lift your arms over your head, coming to Raised Arms Pose once more. Finally, exhale and lower your arms to Mountain Pose. This is a simple pose but, one that is quite useful because of how much it helps the spine. Cat-Cow Stretch is the combination of Bitilasana (Cow Pose) and Marjaryasana (Cat Pose). Performing these two asanas everyday will help to keep your spine supple and healthy. Get on your hands with your knees beneath your hips and wrists beneath your shoulders. As you inhale, move into Cow pose by lifting your sit bones upward, pressing your chest forward, and allowing your belly to sink to the floor. Keep your shoulders relaxed and look at the floor. As you exhale, come in Cat pose by rounding your spine outward and tucking in your tailbone. Move between cat and cow for between 5 to 10 breaths. This is one of the most famous yoga poses for a reason — it feels fantastic and helps exercises may muscle groups. After performing a Cat-Cow, return to a neutral hands and knees position. Slowly straighten your knees and move your buttocks towards the ceiling. Keep your palms down on the matt. Gently straighten your legs as much as possible and keep your heels close to the ground. Hold this pose for between 30 to 60 seconds as you breathe. This simple pose is very useful for strengthening your core, which will improve your posture and reduce the likelihood of back injuries. Spread your fingers and press down through your arms. Lengthen the back of your neck and pull in your abdominal muscles. Tuck your toes in and lift your thighs away from the ground so your body forms a straight line. Hold this position for between 5 to 7 breaths. This simple asana will firm up your things and buttocks while stretching your hip flexors. Take a deep breath, straighten your spine and draw your shoulder blades backwards. Hold this position for between 5 to 10 breaths. Thanks for reading 5 Everyday Yoga Poses To Stay Fit And Healthy. Why not give these yoga poses a try to see how much they can improve your health?